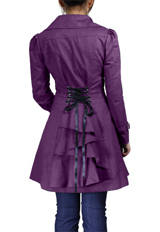 This jacket is fitted waist lace-back ruffled feature, button fastening and belt straps to cuffs, fully lined, the whole design shows your stature more slender. Standard size approx. length: 33.5 inches; Plus size approx. length: 39.45 inches.